This page begins the title, 'On Betrothal.' Also, it shows how medieval scribes designed their pages of text so that the hierarchy of its divisions was clear. Using different sizes of letters, styles of handwriting and colours, they indicated the beginning of the major division (large, coloured letter), headings (smaller letters in colour) and subheadings (smallest letters in colour). Vellum was a precious material. 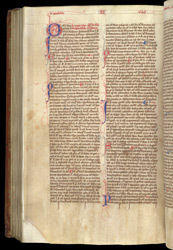 Even a considerable piece missing did not prevent it being used in manuscript (lower left corner).